My husband doesn’t like to dance. I do. Our compromise? Partner yoga! Scroll down to see how we got into and out of this pose and you will see how partner yoga can be a dance. It may not be a pretty one, but it’s ours, and that makes it beautiful to me. Getting into and out of yoga poses on our own can be a challenge. Add another body into the mix and it often becomes hilarious. If we can laugh at ourselves and with each other as we fumble through challenging transitions on the mat, maybe, just maybe, we can do the same as we stumble, fall and then get up and try again in our relationships. Now, I know where your mind just went and when practicing with your significant other, partner yoga can most definitely increase the romance in your relationship. 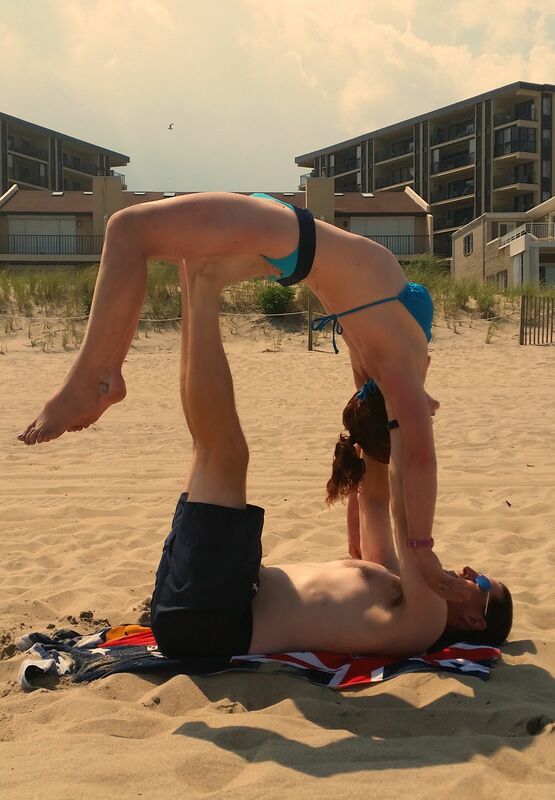 But partner yoga is not just for romantic couples. As we as a culture become more and more reliant on technology we are losing the art of communication when we are face to face and are touching each other less and less. How can we shake hands on a business deal that is done via cyber space? How do we give our friends a birthday hug on Facebook? Study after study has shown that friendly touch decreases anxiety and blood pressure and increases endorphins. So does the practice of yoga. Add the two together and the result is more happy, healthy humans! Run out the door to work at 6am, drop the kids off at school, pick up the groceries for dinner, pick up the dry cleaning, your son bolts off to art class, your daughter sprints to soccer practice, answer emails, homework, walk the dog- Whew!!! Sound familiar? Our days are full and we often forget to just sit down and be, with ourselves and with our loved ones. Partner yoga carves out some time from our busy days to be in in each other’s presence, to be in the moment, and to simply enjoy our loved ones. So take a few minutes and try this funny dance called partner yoga with your loved ones and watch as your relationships bloom and you become a happier, healthier person! 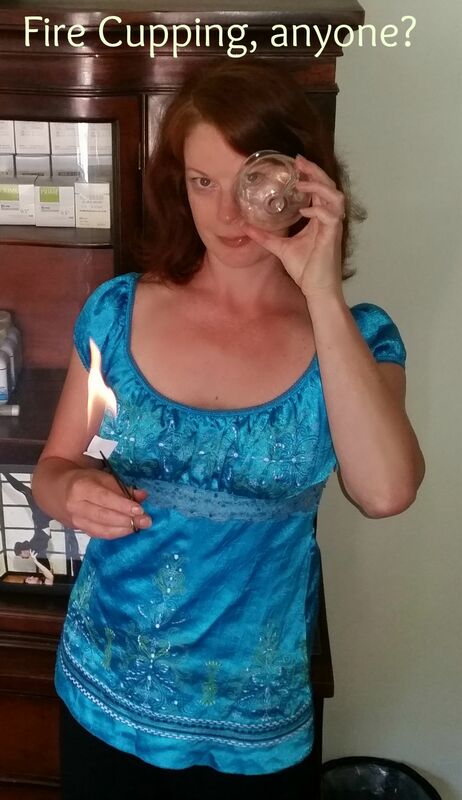 Well, first, and most importantly, the cups acupuncturists use in this therapy are most definitely NOT on fire. 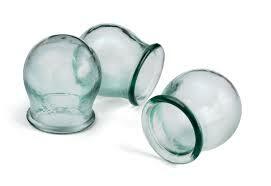 And secondly, the health benefits of cupping are indeed far reaching. Although fire cupping may not be in your everyday vocabulary and probably isn’t a popular first date topic, it has been around a long time. It was first documented as being used by the Egyptians as early as 1550 BC in one of the oldest known medical textbooks in the world, the Ebers Papyrus. Not to be outdone by the Egyptians, cupping was also used by the ancient Chinese, early Eastern Europeans, early Middle Eastern cultures and the North American Indians. What, exactly, is Fire Cupping? One way to think of cupping is to compare it to a massage, but in reverse: the cups pull your muscles up, rather than pushing them down. The cup is able to pull your muscles up because your acupuncturist has first removed the oxygen from the cup to create a vacuum using fire. I know what you’re thinking and don’t worry, the fire is put out well before the cup is applied to the skin. Why would I choose this unusual therapy? Do you have tight shoulders from sitting at the computer all day? Do you have a knot (or 6) in your back with your boss’s name on it? Do you have nagging muscle aches from over doing your workout last weekend? 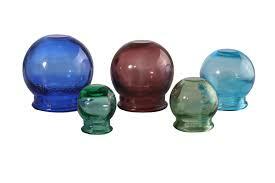 Cupping gets circulation moving and quickly brings relief. Do you feel like your immune system has been through a war fighting off allergies, colds or the flu? Cupping boosts the immune system and can be used as part of a preventative medicine routine to keep your immune system strong and you healthy. Are you still hesitating? Contact me with any questions you may have!